To this day, I have still never seen these movies: Ray and Walk the Line. There are probably a few reasons why I haven’t, but one of the most important reasons concerns the fact that these movies were extremely hyped upon their release. Everyone was blowing their load. And by everyone, I guess I mean critics and my parents. So, I never saw them. I have a tendency to shy away from things that have received too much positive hype. I know myself and I can usually expect that I will be let down. Crystal Eaters. I awaited the release of your book for months. And when it came out, I ordered it. And when it arrived at my house, I didn’t read it, at least not for a while. I wanted to pick it up and start it, but I kept seeing all of these intensely wordy and existential reviews popping up on Twitter (I’m reasonably new to Twitter). 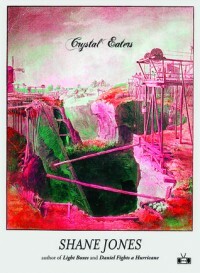 I usually don’t know what to make of intensely wordy and existential reviews, people who say that reading Crystal Eaters is like setting your brain adrift in the primordial muck of your ancestral wandering and watching it develop a higher consciousness as you stand stuck on the shore of your own punitive physicality. What? I read it recently. I had high expectations. I’d never had a reading experience that was like tripping balls. I still haven’t. I don’t know that I want to trip balls when reading something. So, Crystal Eaters. It had one of the coolest concepts I had ever heard of, so naturally, while awaiting its release, I started to imagine what the book might be like. Months of imagining. It was like being in high school and idealizing the girl who has the locker across from you and finally having the chance to speak to her when you both find yourselves the last ones out the door from spanish club. And boom! You walk up with the perfect opening line only to hear her squeak one out because she doesn’t notice you coming and she’s never noticed you. All of this is to say that reading Crystal Eaters was nothing like a fart. It was a book that kept me up late. It frustrated me. I talked to my fiancé about it endlessly and now she is reading it because she wants to have a better idea of what I am talking about so we can discuss it further. Crystal Eaters isn’t what I thought it would be. And trust me, I thought a lot about what it would be. Still, I liked it. It was one of those books that expanded the boundaries of what fiction could be. You see, I don’t have a novel. I am a writer in my early stages. I sometimes struggle with what is allowed. Crystal Eaters was a new and necessary experience in my reading career. I think that most of what we read, most of what we like to read, most of what we keep coming back to, is like masturbation. We know how it works. We know just what to do to get in and get out with an expected level of enjoyment and no new surprises along the way. Crystal Eaters was more like tantric love-making. There was a lot of emphasis on breath and position and patience and sensation. It is something people should learn, or at least expose themselves to. Either way, Crystal Eaters is on my reading list for a fiction workshop I’m teaching this fall. I’m excited to show 12 young writers what fiction is capable of doing. If you’ve made it this far, here’s another thing: I don’t like my MFA program. If I was writing a review of it, it would say something like: existing in my cohort is like a brief and deadly foray into post-Chekhovian Disneyland in which an appendage is left behind on every ride in the hopes that some fresh-faced Mickey enthusiast might find it and carry it home as a prize. But because that doesn’t make sense, I will simply leave it at: I don’t like it. It’s hard to get honest feedback. It seems like everyone’s comments really do make a “foray into post-Chekhovian Disneyland in which an appendage is left behind on every ride in the hopes that some fresh-faced Mickey enthusiast might find it and carry it home as a prize.” Nothing makes sense. The only person who I can ever count on for any honest feedback is my fiancé. So honest in fact that I always make a resolve to never show her my writing again because the truth hurts, but then I realize that I need the truth and the cycle is repeated over and over again. That went on for a while. My only intention today was to chat with Amazon customer service, but then I saw your tweet. Crystal Eaters is a great accomplishment. If it is what you wanted it to be, then that is great. It is hard to do that with fiction. I’ve yet to finish writing an entire book. I also really enjoyed The Cow in the Lake. I can also almost guarantee that I will not be taking a trip to the theater to see Get On Up. The cast looks great and I do love James Brown. It’s just a hype-thing. Remy and her relationship with mother and father. The new dog and the new dog’s name. The father’s struggle with the mother’s sickness. Relationship between town and city. Literal vs. figurative use of crystals and their importance. Z and his role in the ending. Pants/Adam and his role in the ending with his mother. The language. It might hinder the plot a little bit, but it is striking and unique and who needs plot when you can have experience. After all, only a small part of life ever feels like plot.